Every Man Jack Deodorant is not a very flashy deodorant, however you do not need to be flashy for it to work. It currently holds a 3.1 star rating on Amazon, which is fairly low. In addition, it does not seem like there have been a lot of sales of this product, with there only being 151 reviews. So let's check it out and see if this is a diamond in the rough, or if people are not buying this for a reason. Every Man Jack Deodorant is an aluminum free, stick deodorant. Most people are more than used to the stick deodorant so this is obviously the most popular choice for people just getting into the natural deodorant game. Plus it is pretty much the best overall choice, as it both deodorizes and absorbs sweat well. Many natural stick deodorants are usually made up of a form of natural oil or butter, like shea butter, along with baking soda, or one of the other natural absorbents, and essential oils for the fragrance. This natural deodorant has a lot of great ingredients inside. Nearly all of them are naturally derived and Every Man Jack Deodorant also labels where certain ingredients are taken from. In fact, they claim that 99% of the ingredients are naturally derived. The stuff inside this deodorant is as follows: Propanediol, Water (Eau/Aqua), Sodium Stearate, Zea Mays (Corn) Starch, Glycerin, Silica, Polyglyceryl-3 Laurate, Stearic Acid, Aloe Barbadensis Leaf Extract*, Hamamelis Virginiana (Witch Hazel) Leaf Extract, Gossypium Herbaceum (Cotton) Flower Extract, Calendula Officinalis Flower Extract*, Commiphora Myrrha Resin Extract, Usnea Barbata (Lichen) Extract, Citrus (Grapefruit) Seed Extract, Chamomilla Recutita (Matricaria) Flower Extract*, Salvia Officinalis (Sage) Oil, Rosmarinus Officinalis (Rosemary) Leaf Oil, Fragrance/Parfum. As you can see, the bulk of the ingredients are natural and many are mentioned what they are derived from. The cotton extract and witch hazel are there to absorb your sweat, while the lichen helps to control your body odor. However, there is one ingredient can have negative effects on the body. Parfum or synthetic fragrance, has been shown to cause skin irritation. For a natural deodorant, that is a bit disappointing to see. The addition of parfum does not make a lot of sense, seeing as they also include both sage and rosemary essential oils for the scent. Every Man Jack Deodorant actually has a few certifications around this deodorant. For starters, they have the little bunny logo, which certifies that this product is cruelty free. This simply means that it was not in any way, shape, or form, tested on animals. In addition, there is also a certification for gluten free. You will be getting quite a few good benefits from this natural deodorant. Every Man Jack Deodorant is aluminum free, which is very important. Aluminum, in the form of aluminum chloride, aluminum zirconium, aluminum chlorohydrate, and aluminum hydroxybromide, prevent us from sweating. This happens when the aluminum ions are drawn to cells that line the sweat ducts, causing the cells to swell and squeezing them closed so sweat can not get out. The reason this is bad is because aluminum is also a known neurotoxin that has been linked to breast cancer and other neurological disorders like Alzheimer's. So yeah, cancer and memory loss, not so good. Besides that, this deodorant also does not include propylene glycol, parabens, phthalates, or dyes, which are all bad for your health. Every Man Jack has manufacturing facilities in Minnesota, California, Vermont, and Texas. Every product is made and sourced within the United States. They were founded on the idea of bringing naturally derived formulas to men in masculine, recyclable packaging at an accessible and affordable price. All of their products follow the same principle. Naturally derived from plants and other sources, cruelty free, aluminum free, chemical free, gluten free, and of course made in the USA. In addition, their shampoo and body washes are made out of 50% recycled materials. Besides deodorant, Every Man Jack manufactures many other body care products. Their naturally derived products include hair products like shampoo, body care like body wash, deodorant, and lotion, skin care like sun lotion, and facial cleansers, shaving accessories, and more. Every Man Jack Deodorant is a convenient and easy transition into natural deodorants by using a stick design. Since most men use a stick deodorant, it is easy to simply switch to a natural brand without a huge change in style. The ingredients inside this natural deodorant are 99% naturally derived. In addition, certain extracts are also certified organic. Not only that, the deodorant is also labeled vegan, gluten free, and aluminum free. Animal testing is absolutely horrible. That is why it is always great to see those small bunny ear logos that certify the product as cruelty free. Thankfully for Every Man Jack Deodorant, it is. This natural deodorant avoids including many ingredients that have been proven to be toxic to your health, leading to serious health issues. Every Man Jack does not include propylene glycol, parabens, phthalates, or dyes. While 99% of the ingredients may be naturally derived, there is one that is a cause for concern. Parfum, also known as fragrance. This is a artificial additive to boost the smell of a certain product. However, is is also known to be a skin irritant. And when you are putting something on a fairly sensitive area like your underarm, the last thing you want is skin irritation. There have been various complaints from customers who have used this product. In fact, there are over 30% negative reviews for Every Man Jack Deodorant. 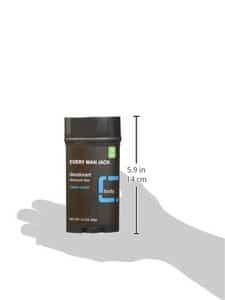 The most commonly seen complaint is that the deodorant caused some sort of skin irritation or in some instances a rash. This could be due to the parfum, or it could be an allergic reaction to another ingredient. Even though there are a lot of great natural ingredients here, parfum is just something we can not overlook. It is constantly being reported for skin irritation and may very well be the reason many have complained about that issue with this product. Plus, it really does not make any sense of putting that in this deodorant, when rosemary and sage essential oils are already included. While this deodorant may very well work, the fact that there are a substantial amount of people complaining about the same issue is disconcerting. If you have highly sensitive skin, it may be best to avoid this product. However, if you believe that you will be alright, by all means, this could be a good product. Just be sure you are aware that it does include parfum. You can grab yourself a 3 pounce stick of this deodorant on Amazon for $7.81. For more information on the best natural deodorant, head on back to Green and Growing. Here are some top questions that I found for people seriously considering buying Every Man Jack Deodorant. Is this a Clear Stick, Gel, or White Solid? This is a white solid stick deodorant. Would this cause skin irritation? There is a strong possibility of that, yes.